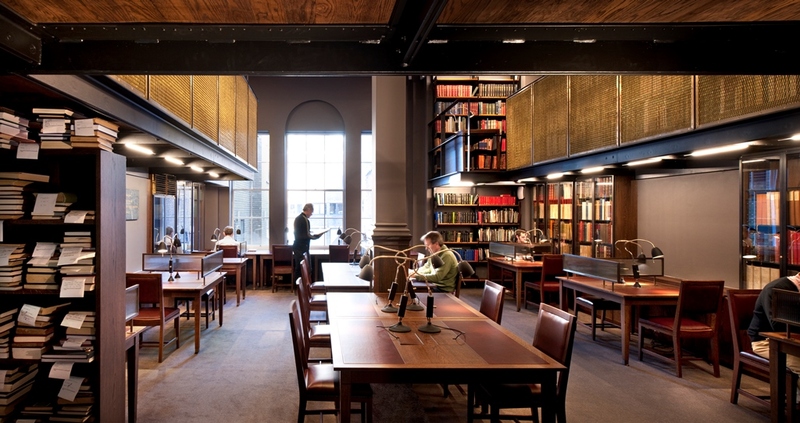 As an institution the London Library is unique and members each have their own experience of it. For some, it is a calm place to work. Following an extensive refurbishment programme the Library has five designated reading rooms and a range of individual writing spaces fitted into nooks and crannies throughout the building. An informal community of writers has developed at the Library and they relish the opportunity to work amongst their peers. Whilst the main Reading Room is a silent reading area where electronic equipment is not permitted, the use of technology is encouraged throughout the rest of the Library, with wi-fi coverage and free access to a very wide range of electronic resources including JSTOR and the recently added 17th-18th Century Burney Collection of Newspapers. The e-library is one of the most rapidly expanding collections, available for members both in the Library and remotely via our website (www.londonlibrary.co.uk). For other members, it is the depth and breadth of our collections that is the draw. We hold over one million items, 97% on open access and almost all available for loan. Here you can find recently published volumes shelved next to books from the 1730s. Our periodical holdings cover 750 current titles as well as backruns of over 2,000 titles, many of which are now discontinued. The focus of the collection is arts and humanities, and we are especially strong in history, topography, philosophy, biography and religion. There are over fifty languages represented on our shelves, with particular strengths in French, German, Italian, Russian and Spanish literatures. The Library’s unique classification scheme was created around the collection by Librarian Charles Hagberg Wright (1893-1940, our longest serving Librarian to date). Having despatched the arts and humanities books to their appropriate areas he was left with some 40,000 volumes which formed the wonderfully named Science & Miscellaneous section, and one fortuitous result of this scheme is the element of serendipity that it introduces. There are not many libraries where books on Butterflies sit next to Camels, or Dentistry to Devils, or even Housing next to Human Sacrifice. It is this juxtaposition that can lead writers in different and unexpected directions, creating connections that they had not considered. One of the Library’s greatest resources is its staff, and our specialist team are not afraid to tackle the tricky enquiry. Recent enquiries have covered the peasant costume of medieval Spain, historical uniforms of the Hungarian army, and the various patterns to be found on larks’ eggs. It is a service that is greatly appreciated by the members who visit the Library and by those who use our postal service. Membership of the Library is open to all, and at less than £40 per month is cheaper than most gym fees. Here you can exercise your mind and then your body, if you wish, walking the eight floors up to the Members’ Room from the Basement. The Library has introduced a number of initiatives to ease the financial burden, such as reduced fees for young people and the spouses of members, and supported membership through the London Library Trust for those to whom the membership fee would be a barrier to use. Caroline Lawrence is the author of 32 historical-fiction books for children, spanning two series: the Roman Mysteries, set in first century Ostia and the P.K. Pinkerton Mysteries, set in the 19th century American West. Before becoming a full-time writer she studied Classics at Berkeley and Classical Art and Archaeology at Newnham College Cambridge, and worked as a primary school teacher. She is currently the president of the Joint Association for Classical Teachers. Caroline also maintains a highly informative blog, which is itself a great reference site for children. She posts lots of factual information and links about the historical period she writes about, as well as tips on writing for young people. In describing her research process the author states that she imagines she is “going to a foreign country”. This means she takes a multi-sensory approach, considering what people’s voices sound like, what food and drink was available and what clothes and objects people used. Her preferred material is primary sources, like contemporary fiction, eyewitness accounts and objects: “there is nothing like handling an object from your time period to bring it alive”. She says that she finds herself getting “quite nerdy” about objects, weapons in particular, because being specific and accurate is important to the story. When asked about how she goes about acquiring this information Caroline describes herself as being “intrinsically lazy…My husband Richard is a member of the London Library. I often send him off on a quest for specific books. Very occasionally I use the Classics Library at UCLbut I use the internet for 95% of my research”. It is obvious from her blog that she is enthusiastic about promoting good online research and the resources that she has used to inform her work. “Most of my sources for the P.K. Pinkerton books, set in Nevada Territory 1862, come from online newspaper and magazine archives”. She is constantly amazed to discover the “vast wealth” of primary sources that were available online. In Caroline’s first series of books, The Roman Mysteries, language and the way the characters spoke was not so important to her, “because Latin would have sounded modern to them”. However in her latest series, the P.K. Pinkerton Mysteries, language in particular has been a real focus for her research. “I am much more careful to use authentic vocabulary, word order and slang. In fact, I’ve composed a whole dictionary of authentic and non-authentic words for Nevada Territory in 1862”. (http://www.archive.org/stream/newdictionaryofa00clapuoft/newdictionaryofa00clapuoft_djvu.txt). “The Internet Archive is an American non-profit organisation that describes itself as building an ‘internet library’.” They catalogue both born digital content (they created the Wayback Machine) and digitised books. It has a vast range of primary sources, particularly for scholars of America in the 18th, 19th and early 20th centuries, but due to the resources coming from a wide variety of sources the classification is somewhat haphazard and not all resources are available in all formats. “I find it to be a fantastic resource for finding research material”. Caroline has a subscription to the Harper’s Magazine online archive (http://harpers.org/archive/), which she finds particularly useful for the illustrations. She describes Mark Twain’s online archive (http://www.marktwainproject.org/) and Alfred Doten’s journal (ISBN 978-0874170320) as her “go-to reference works”. The Mark Twain archive is “a very well put together website with an easy-to-use search-engine” that enables the user to search through Mark Twain’s letters, works and photographs as well as writings about him by his contemporaries and maps of the parts of the world he lived in. It has a helpful user guide, and each record is accompanied by short biographies of any other individuals mentioned in the writings. Alfred Doten’s journal is not available digitally, but Caroline relies on it for “fascinating glimpses into the daily life in the American West of the second half of the 19th century” and often quotes from it on her blog. Caroline rather interestingly adopts an auditory approach to some of her research in order to be better able to use the appropriate language and “to get the speech rhythms right”. As well as listening to period-appropriate audio books, she will often read parts of a resource she is using into her iphone, and then listen to it when she is out and about. One might argue, however that she is not completely accurate with this assessment of her research. Although she frequently posts about her sources on her blog, Caroline’s method of recording her sources is less than rigorous: “I usually just jot down key phrases or sentences on my computer”. Additionally her phenomenological focus on how things looked, how things sounded, is a research goal that is more specific to fiction, or other creative arts. She is not interested in analysis, but in “bringing a world to life”, which by necessity affects the information that she is looking for. So how do we, as librarians, go about supporting authors like Caroline in her work? Caroline suggests that easily accessible online support, such as the blog she herself has created, would be most helpful. “The internet has a truly amazing range of literature available at the touch of a keyboard” she says. “For a writer of historic fiction, it is important to know how to reach all those archives of primary sources that might be useful”. For this issue of Refer about information services for writers and journalists, the Editor asked four historical novelists – Helen Dunmore, Stef Penney, Kate Williams and Katy Darby – about their choice of historic period, their research process and their use of libraries. Helen Dunmore is anacclaimed bestselling author of eleven novels including The Siege, The Betrayal and The Greatcoat. A Spell in Winter won the inaugural Orange Prize for Fiction. Her new novel The Lie was published in 2014. What attracts you about the historical period you write about? I have written about a number of historical periods. The Lie, set around the First World War is the story of the times of my grandparents. In my childhood one had the sense that everyone of that generation was affected somehow – a great uncle gassed. But people didn’t really want to talk about it. Now that speaking voice is gone. How do you go about doing research? Research can be a trap. It is enjoyably seductive to go here and go there finding things out. The writer who researches is far easier to be that the writer who writes the first draft. Its best to start writing and mark the text where more research is needed. Are there any particular libraries or research resources you especially like? I have used many small special libraries depending on what I am researching – for example collections about gardens and World War 1. It wouldn’t be fair to name any particular library. But I am very grateful to libraries – you can write that! Stef Penney’s first novel The Tenderness of Wolves won the Costa Book Award in 2006. Although set in Canada in the 1860s Stef Penney did all the research in libraries in London and has never visited Canada. I don’t feel that I’m writing about any single period, having – so far – set stories in the 1860s, and the 1980s – and am currently working on a story set in the 1890s. But that said, perhaps there is something about late 19th century that does particularly appeal to me – it’s not that long ago, so it is feasible to give a character a recognizably ‘modern’ mind – as you can see when you read authors of the period, from Tolstoy to George Gissing. And yet cultural mores were that much more restricted, giving characters more problems (or at least different ones) than they would have now. What I particularly enjoy is the challenge of making a female character do something that might have been thought of as impossible for a woman at the time – it’s right on the cusp of feasibility. Research is completely interwoven with writing for me. I start long before I write a word, and never really stop. There’s always another direction or angle to look at. It’s a positive in that I am constantly stimulated and excited by discovering new stuff, and a negative in that the volume of knowledge that you either know (or feel you don’t know but should really find out) can be overwhelming – somehow you have to find a balance between the two. For me, the British Library has been a brilliant, essential resource. I love going there, even when I am not researching, for a change of atmosphere – which can be very helpful at times. And I have to acknowledge Wikipedia, which has made the researchers job far, far quicker, and can answer the most esoteric questions. Kate Williams is a historian, broadcaster and novelist. She has written biographies of Emma Hamilton and Queen Victoria and a novel The Pleasures of Men. Her new novel The Storms of War, first of a trilogy starting in 2014, is published in July 2014. I’m fascinated by the eighteenth and nineteenth century because its such a time of energy and exploration – and so many women’s voices. Women burst onto the stage – and had a power they’d never had before. I like to get all the research done before I start writing – For my current novel, The Storms of War, on a family in World War One, I hit the letters, the diaries and the archives. Letters and diaries are the best way to capture the voice of the period – through them, you hear the voices of the long dead, hear their hopes and dreams – and then you know how to bring them alive. I research as I’m writing as well…. I love the British Library and for my most recent book I spent a lot if time in the Imperial War Museum – and archives all over the country. Katy Darby’s first novel The Whore’s Asylum was published in 2012. Two of her short stories Cries of London were read on BBC Radio 4 in August 2013. The Victorian period was one of enormous change – social and technological – as well as a rapidly increasing wealth and privilege gap between the richest and the poorest, even as the prosperous middle classes expanded. It was a time of very strict conventions, but also of increasing rights and freedoms, especially towards the close of the nineteenth century. Basically, all human life is here, and so it’s possible to set stories of extremes – forbidden love, desperate murder, violent hatred etc. – in the period without them seeming incredible or ludicrous; it’s much harder to do that in the context of a modern narrative. It’s also a lush and romantic period, visually speaking – the clothes were frankly fabulous, the cabs and trains elegant … and of course the literature (Dickens, Collins, the Brontes, Thackeray etc.) is fantastic. Finally, it’s incredibly well documented – the Victorians were maniacs for social studies and reports, and there’s a wealth of research resources out there for those who care to look, as well as early photographs, surviving buildings etc. I read fiction of the period, contemporary to when my novel’s set. For example, when writing The Whores’ Asylum (set in the 1870s and 1880s) I read a lot of Conan Doyle’s Sherlock Holmes stories. I read modern fiction about the period – eg Sarah Waters’s first three novels. Then I read nonfiction of the period – social studies, essays, lots of contemporaneous newspaper articles available on the excellent and vast archive that is www.victorianlondon.org – things like Bradshaw’s guides to London, to find out details like how much a cab fare was from Euston to the West End – and finally I read modern books and articles about the period. I have a whole bookshelf of this stuff and I read it for pleasure as well as research purposes. Are there any particular libraries or research resources you especially like? Victorianlondon.org, as mentioned above. Lee Jackson, who runs the site, styles it: “The Dictionary of Victorian London – an Illustrated Encyclopaedia of the Great Metropolis”, and that’s exactly what it is. He writes both fiction and nonfiction about the period and has gathered an astonishing wealth of material on there, from old photos to snippets of articles about just about everything from hansom cabs to debutantes’ balls. The best thing is that you can look up articles by subject, e.g. Prisons will get you pieces on Newgate, Holloway, Millbank etc. – sometimes it’s journalistic thinkpieces, or first person reports by visitors to prisons, and sometimes even personal accounts by the prisoners themselves. It’s a black hole of browsing, though – I can spend hours on there. Shire Books are good sources too – specific, short and full of visual references – period photos, paintings, artefacts etc. I even managed to find one on Victorian & Edwardian Horse Cabs!